Drs. 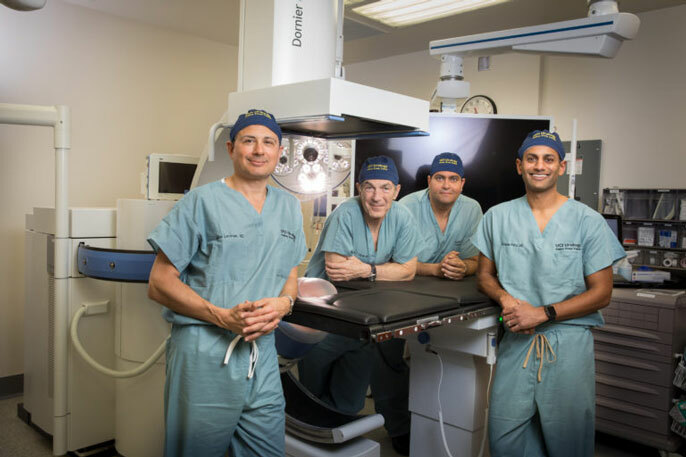 Jaime Landman, Ralph Clayman, Ramy Yaacoub and Roshan Patel (from left) show off UC Irvine Health’s new Dornier Gemini system for the noninvasive treatment of kidney stones with shock waves. Surrounded by high-voltage electrical boxes, foot pedal controls and sleek computers, UC Irvine Health’s new kidney stone pulverizer is both a step into the future and a blast from the past. The machine certainly figures to change UC Irvine’s approach to the ailment, which currently affects about 10 percent of adults in the U.S. After decades of pioneering minimally invasive surgical methods to remove the painful accretions, UC Irvine Health urologists are now turning to an older, incision-free remedy: electromagnetic shock waves. Discovered almost by accident, shock wave therapy for kidney stones sprang from a curious phenomenon involving supersonic jets and rainstorms. When water droplets collided with a plane approaching the sound barrier, they created shock waves that dented the aircraft’s metal surface. Physicists at Dornier, a German aviation company, wondered if the concept could be adapted for medical use. The result, introduced in 1980, was Dornier’s HM1 lithotripter (derived from Greek words meaning “stone crusher”), which had patients lowered into a tub of water and zapped with focused acoustic waves. The technique worked well, but the machine was cumbersome. As smaller, portable units were unveiled, the success rate dropped and side effects – including damage to surrounding tissue — climbed, partly because some operators lacked adequate training, according to medical journal reports. For these reasons, shock wave treatments were rarely administered at UC Irvine; plus, the therapy was only available inside a mobile surgery truck that visited various local hospitals. Dornier’s new Gemini stone-busting system — souped up with more sophisticated imaging and punchier shock waves — promises to change all that. Housed in a customized surgical suite at UC Irvine Medical Center, it has the potential to disintegrate larger, harder and deeper stones than previous machines, says Dr. Ralph Clayman, a renowned kidney specialist, textbook author and surgical innovator who served as dean of UC Irvine’s School of Medicine and founding chair of its urology department. For patients who want their urethras to “remain a one-way street,” Clayman says, shock wave therapy offers a way to avoid scalpels, stents or endoscopic surgery, in which a thin tube is pushed up the urinary tract so that a tiny laser fiber can blast the stone. As with any medical procedure, shock wave treatments carry a few risks. Lingering stone fragments occasionally cause infection, fever or obstructions requiring a second round of therapy later on. Most patients also temporarily experience blood in their urine, a result of the shock waves hitting nearby tissue. But complications are rare — 3 to 4 percent overall — and usually minor, says Dr. Ramy Yaacoub, a member of the UC Irvine Health urological team. It will take a year for UC Irvine Health doctors to fully evaluate the Gemini’s effectiveness and publish the findings, but if the device works as expected (many of the components are already in use in Europe), “you’ll see a renaissance in shock wave therapy,” Clayman predicts. “As a university, our job is to be at the forefront and push the field forward,” he says. Toward that end, UC Irvine researchers are also conducting clinical trials to learn whether certain foods or vitamins can reduce a person’s tendency to form kidney stones. One promising candidate is coconut water, which in a recent small study on campus dramatically boosted the amount of crystal-dissolving citrate in urine, Clayman says. Other good sources of citrate include orange juice, Diet 7UP and lemonade, he notes. UC Irvine Health also offers metabolic urine evaluations to determine the causes behind each patient’s stones and develop a personalized plan to counteract them. In general, UC Irvine urologists recommend drinking 3 quarts of fluid per day (anything except dark colas) and eating a low-salt, Mediterranean-style diet. What kind of person donates a kidney to a stranger?